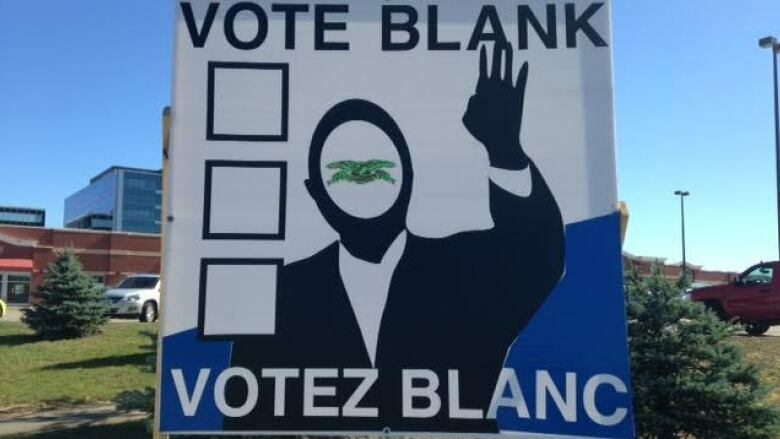 The streets of Moncton are busy with official signs from all of the political parties featuring the faces of local candidates in the upcoming federal election, but lately signs with a faceless figure asking people to "Vote Void" are turning up. Many of the signs include a faceless figure but there is no indication who is behind the campaign. Mario Levesque, an assistant professor of Canadian political science at Mount Allison University, said the idea behind the "Vote Void" movement is simple. "They're basically saying that they don't like the choices ... we would like an option on the ballot to vote 'None of the above,'" he said during an interview on Information Morning Moncton on Wednesday. A spokesperson for Elections Canada said they are aware of the "Vote Void" signs in Moncton and are keeping an eye on them to see if they spread. Levesque points out that a "None of the above" option was included on ballots in the most recent election in Ontario and 31,000 voters checked it. "So it is quite significant," he said. In the federal election "None of the above" won't be an option. However, voters can simply leave their ballot blank and put it into the ballot box and it will be counted by Elections Canada as a rejected ballot. "I hope a lot of people are paying attention to this, in particular the leaders of our political parties," he said. Levesque said politicians should reflect on the fact that 31,000 Ontario voters voted "None of the above." "That should trigger some alarm bells for the political party leaders to improve their platforms to try to appeal to more voters," Levesque said. Elections New Brunswick tried to add a "None of the above" option in 2014, but four of the political parties said more time was needed to explore the idea. The People's Alliance said it would be supportive of a change. The movement is relatively new in the Maritimes, but it is already available on ballots in Alberta, Saskatchewan, Manitoba and Ontario. Levesque said while it is not in place for the federal election, there is a movement to get it included on the ballot for the 2019 federal election. "From the politician's point of view, they're scared that 'None of the above' may get more votes than them so when you think about it they're a little intimidated by this in some ways but really it's a way for the voters to become involved in the election," he said. By having a choice, Levesque said, Canadians and the political parties will know how many people are engaged politically but unhappy with the political choices. He said it is better to put a blank ballot into the ballot box on election day rather than not show up at all. "Far better to go in and write in there 'Marge Simpson' or something, better yet write in your mother-in-law's name or something like that or vote for two of the candidates or leave it all blank," he said. "What it does is tell our political leaders that you are paying attention, you are engaged and things do matter to you but you don't like the choices." Levesque said the first option should always be to vote for your preferred candidate.